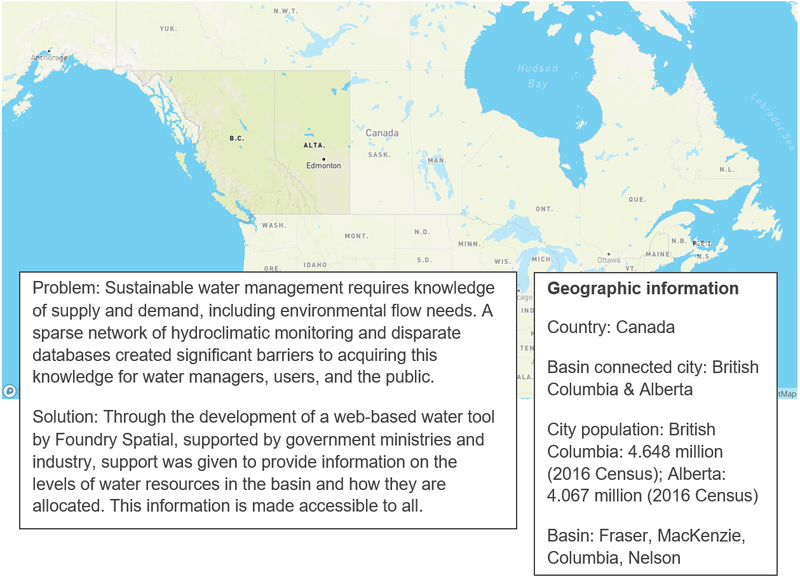 The BC Water Tools have demonstrated an effective approach to providing information on water supply and demand to be considered in decisions regarding water allocation. Thousands of people each year use the tools to find out information on the timing and amount of natural water supply, existing water allocations, and the needs of the environment. The tools provide in a manner of seconds, information that would otherwise take two weeks to assemble and compile. By providing rapid access to this information, people can become informed more quickly on water use pressures and proceed with more detailed data collection or analysis where needed. 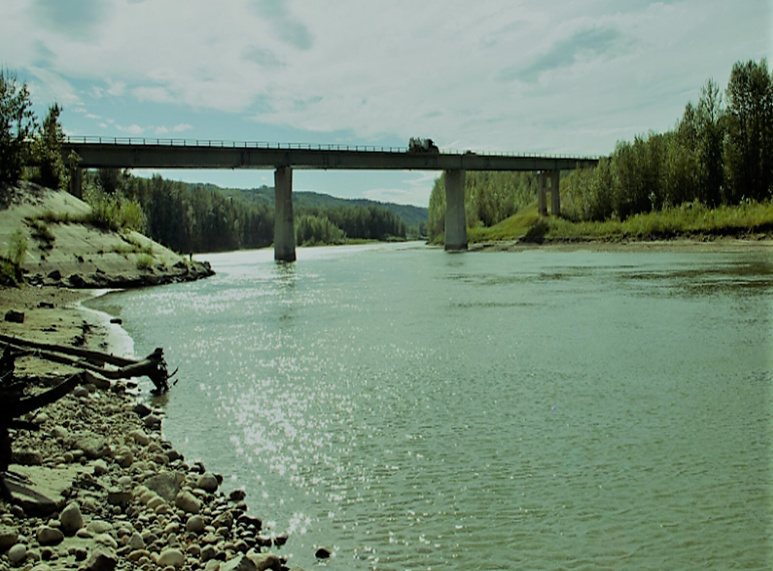 The Water Tools have been successfully applied across more than 1,000,000 km2 of Western Canada and are currently being evaluated for implementation in other jurisdictions across the world. The outcome of the tools is that it increases transparency and democratizes knowledge from catchment to tap allowing all parties to engage in discussions from a more informed perspective. Water stress from over-allocation of surface or groundwater resources by different water users is a current or emerging problem across most of the world. Basin managers are faced with increased problems of how basin’s water resources can be proportionally allocated to all water users while maintaining environmental flows. Current water stress can be attributed to overpopulation, industrial use, climate change and other factors.  Often-times basic information on the availability and use of the resource at a catchment scale is unavailable. In British Columbia, a province in Canada, the same challenge of managing withdrawals within sustainable limits has been faced. Jurisdiction for water allocation rests with the Provincial Government. The Water Sustainability Act which currently governs water management came into force in 2016 replacing the Water Act (1909). British Columbia is roughly 1,000,000 square kilometres, stretching inland from the Pacific Coast across the Coastal Ranges, and across a large interior plateau to the Rocky Mountains, with the north-eastern part of the province comprising part of the Western Canada Sedimentary basin. Understanding supply and demand constraints is critical to the sustainability of the province’s water resources and to ensure that all users’ water needs are met. At the same time, ensuring that environmental flow needs of aquatic ecosystems are protected. This need led to the development of the first decision support tool for a remote area with limited monitoring data and low levels of existing water use, by Foundry Spatial Ltd. Water demands in the basin were increasing associated with hydraulic fracturing for oil and gas development and the desire was to provide accessible tools to help ensure that industrial water use would be authorised within environmentally sustainable limits. 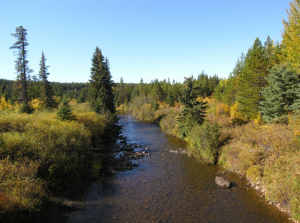 The organisations with authority to manage water resources in British Columbia are the British Columbia Ministry of Forests, Lands, Natural Resource Operations, and Rural Development (MFLNRORD) and the British Columbia Oil and Gas Commission (BC OGC). These agencies supported the development of the water tools, which were built by Foundry Spatial. Over the past two years, Foundry Spatial has been working together with Dr. Tom Gleeson from the University of Victoria to create a ‘Next Generation Water Tool’ which incorporates analytical models linking groundwater use to surface water streamflow depletion allowing for conjunctive water management. To develop the water tools, Foundry Spatial came up with the idea of providing science-based information in a publically accessible manner for decision makers, proponents and stakeholders. Decisions about water use are always about people and values. By providing information efficiently to perform an initial assessment of sustainability at any location, it ensures that every decision is looked at, and resources can be more effectively targeted at high risk/high consequence decisions. The development of the water tools was carried out in three unique ways. Firstly, there was the collection of synthesised/curated monitoring data from dozens of public and private sector databases, which are often difficult to find, access, and interpret.  These data were then fed into analytical hydrology models developed across large regions. The models were calibrated and validated against monitoring data to characterise surface water and groundwater resources, the connection between these resources, and sustainable environmental thresholds for use. Finally the firm made accessible, to all interested water users, the synthesised monitoring data, and the results of the analytical models, at any location using modern web best-practices; essentially a ‘one stop shop’ for water management in the whole basin. The Water Tool helps address long standing needs for better access to information to support decision making. In particular the analytical models providing information on sustainability of water use – connecting supply information with existing demand in the watershed and aquifer context address sustainability goals. The original concept for the tools was developed to solve problems that Foundry Spatial was facing through their consulting work, associated with compiling, analysing and reporting on environmental monitoring data – for regional water resource characterisation and regulatory support. It turned out that the problems Foundry Spatial were facing were not unique but rather common issues that other practitioners in the basin were facing. Figure 1. 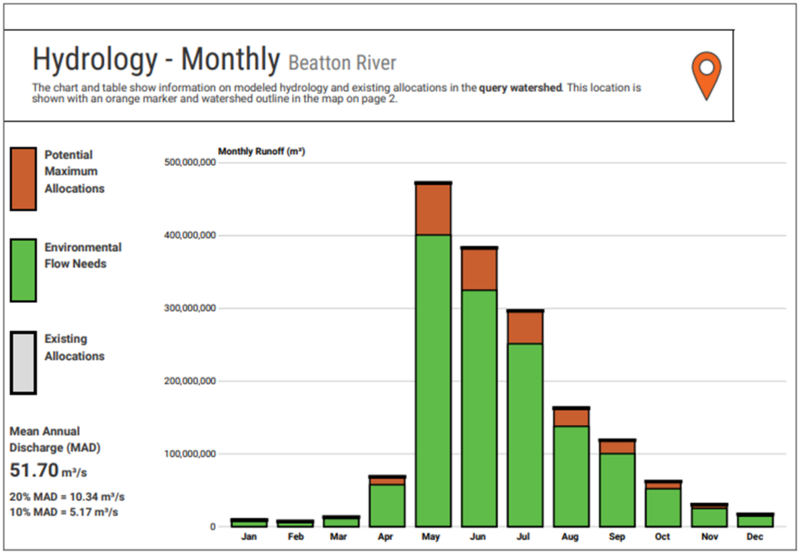 Section of water tool report showing monthly mean discharge, environmental flow needs and existing water allocations. 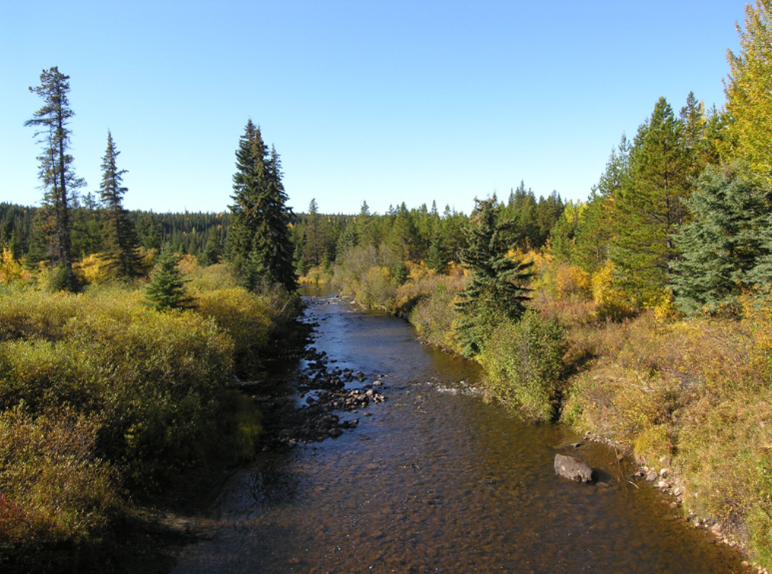 The British Columbia water tool has transformed water management practices in western Canada. The sustainability reporting information in the absence of the tools takes about two weeks or longer of a professional’s time to produce. Ordinarily, traditional desktop analysis reports are not easily publically accessible, and in the absence of the tools, there was a significant imbalance between stakeholders. Those with the time and resources to conduct hydrologic analyses (i.e. government and industry) could do so, but private stakeholders, who would like to do the same (i.e. communities and landowners) were challenged to develop a comparable understanding of a proposed use of water. All the information regarding water resources in the basin, is accessible to all stakeholders. This is not to say that conflict has been completely avoided. Differences in the values and objectives related to acceptable water use persevere, which may relate to the specific purpose of use (i.e. human use vs agriculture vs energy production). These differences are better addressed from a common understanding of the context. One of the key successes of the project is the increased transparency because of the tools. Oil and gas operators can see water supply, and the existing pattern of use from their competitors and all other industries using water. Communities can see supply and demand on any stream or river independent of information that would normally be supplied by an oil and gas operator proposing a new water withdrawal arrangement. The information provided by the tools levels the playing field and allows all parties to engage in discussions from a more informed perspective. Another key point is that the tools are designed to support people with information needs rather than make decisions. People must ultimately make decisions about water use also considering other qualitative and quantitative information. In cases where competing needs exist, a balance must be established or water shortages will occur. With many basins facing increased pressures on their water resources and information regarding the levels and use of these water resources lacking, an online platform is a welcomed approach to help monitor and manage water resources more sustainably. Figure 2. West Kiskatinaw River, northeast British Columbia. The British Columbia approach is broadly transferable, as it is based on sustainability science, recognising the notion that human water use should be managed cumulatively in the construct of natural availability. Variations can exist globally in the hydro climatic sense, the manner in which water rights are managed (policies and regulations), and in the information needs for decision making from country to country. However, the concept of catchment or watershed and aquifer based management grounded in ecological sustainability is universal. In order for the approach to be successful, a commitment to the sustainability of water resource management is needed. Local leadership, within the community or region, which can be in the form of a government agency, an industrial group or an environmental organisation, as the champion to aid in implementation can be the stimulus needed for success. In 2016, an Alberta Water Tool was launched which experimented with a paid ‘information as a service’ approach. After a year of running under this model it moved to an open access model, as it was determined that implementing a financial barrier between sustainability science information and those who want to use it did not achieve the highest and best outcomes of the tool. As such, data and tools developed need to be free and open access, which requires funding to be provided from organisations that share a similar vision or mandate. In addition to the leadership and financial resources, data availability influences the suitability of the approach. Key data requirements include streamflow monitoring data, and records of water rights/withdrawal volumes (permitted and/or unpermitted). Additional data sets such as stream hydrography and/or watershed mapping, detailed land cover and land use, aquifers, groundwater wells, and soils have also been significant in the success of the British Columbia Water Tools.